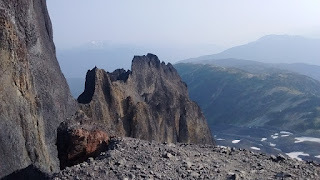 I hiked up Black Tusk today. 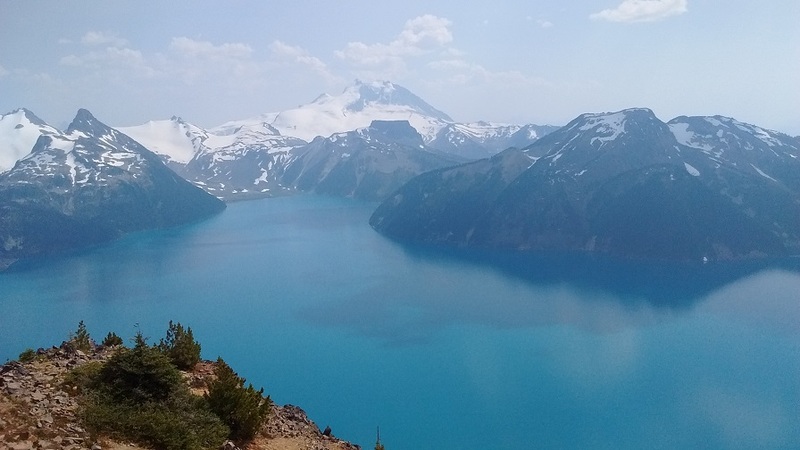 Last night I hiked up to Garibaldi lake, set up camp, then went on a day hike to Panorama Ridge. 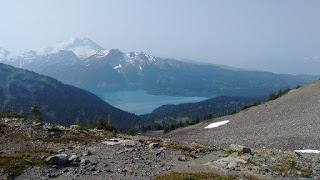 From Panorama Ridge you get and amazing view of the lake. 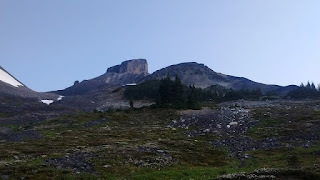 This is the view up to and from Black Tusk. Now for a brief synopsis of the journey, I have to admit that Garibaldi lake is pretty awesome. It's high up. You have to work to get there but it is very nice. You can camp at the lake or at Taylor Meadows but you need to make reservations online first because weekends in the summer are usually booked pretty early. I was able to get a spot mid week. The trail to to Black Tusk viewpoint is pretty awesome. There are lots of places you can water up along the way. 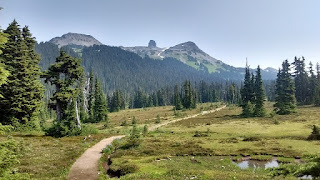 If you are going to Panorama Ridge, which is probably the better hike, you have to water up at Taylor Meadows and carry it with you but the summit is worth it. 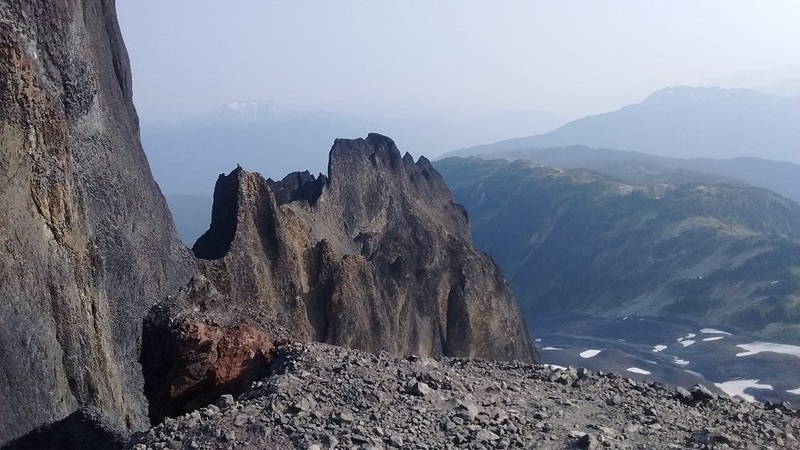 There is a sign at the Black Tusk viewpoint that says end of marked access. It is not recommend you summit due to loose rock. I looked at it and it seemed OK so I had a go. Bad decision. It starts off OK but the further up you go you are basically climbing up and down loose rock that is crumbling as you climb and descend. It's not safe. 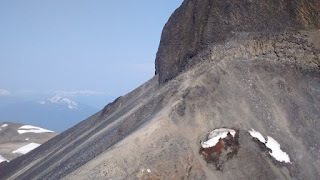 I got to the base of the cone and I look over this ledge and it was straight down. I got sketched out. I turn to my left and see two young girls who had walked along a very narrow ledge with a sheer drop on either side of crumbling rock. They were sitting with their backs to the cone having a chit chat. I took one look at them and said f*ck that and went strait back down again. This is the ledge they walked across. Not me. I don't like crumbling paths with sheer drops. As I was climbing, the cone looked so close I thought it would be cool to get a picture of my hand touching the cone. Then when I got there I thought you know what would be even better? To make it home safely. That was my call. Whenever you're summiting any peak whether it be summer or winter, if you don't feel comfortable, don't do it. That's what I've learned. 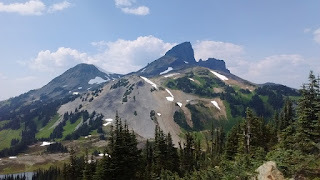 I might do the hike to the viewpoint again because it is a magnificent hike but I'm not going to summit. Not this cowboy. 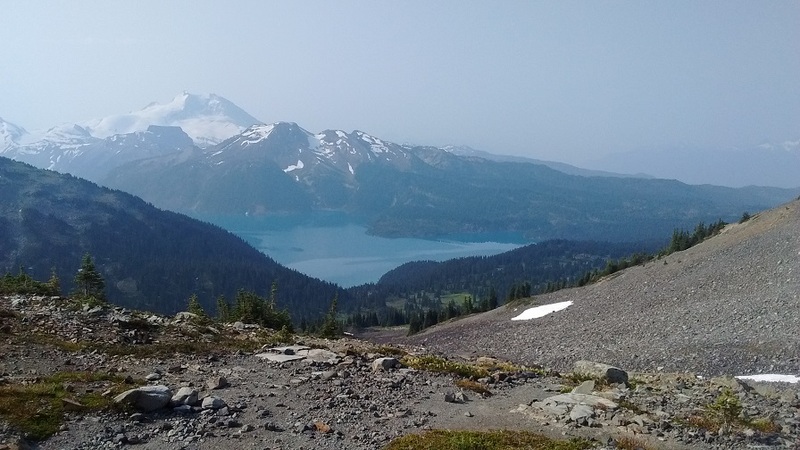 Panorama Ridge you can summit and get a great view of Garibaldi lake and Black Tusk. The best of both worlds. The young girls were competent and successful. I'm just saying summeting that peak is not for the average bear. 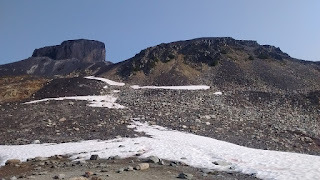 I hiked along the very narrow ledge on the West Lion without a problem. That was on solid rock. Walking along a narrow ledge of crumbling rock is something that I am personally not comfortable with. You and me both. Gravity is a ruthless mistress, she will screw you if she can, best not give her a chance!